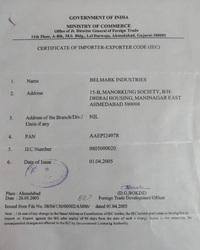 "Belmark Industries", established in 1995, is involved in manufacturing, exporting and supplying an exclusive range of Industrial Products. Our range of products encompasses Slat Expander Rolls, Core Holding Device and Industrial Roll. The range made available by us is manufactured using superior quality raw material that is sourced from reliable vendors of market with the aid of our procuring agents. These products are highly appreciated by customers owing to their intrusive attributes such as user-friendliness, precise dimension, sturdy design, excellent finish and anti-corrosive material. Quality is our prime concern and we soulfully concentrate on improvisation of quality and that’s what our principle in business. We are exporting globally. Under the notable tutelage of our mentor, "Ms. Sonam", we have been able to carve a remarkable niche in the industry. His in-depth knowledge, brilliant managerial skills and vast industry experience have helped us in consolidating our position in the market.